We are now twittering, primarily on what’s being tweeted by President Donald Trump. We are by NO means political. We neither approve nor disapprove of President Trump. Our sole purpose is to help our listeners and readers learn English or improve their vocabulary. 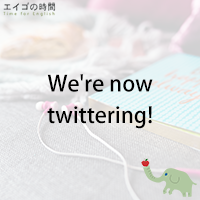 We are constantly trying to figure out how to make English learning part of your lives and this time we’ve decided to try Twitter. More specifically we quote a recent tweet from President Trump every day, translating it into Japanese, picking up a word or phrase that might be interesting to you, adding some grammatical notes or example sentences from time to time. If you’re on twitter, please follow us and share with others! Thank you! Next Post 少しも納得していない – I’m by no means convinced.